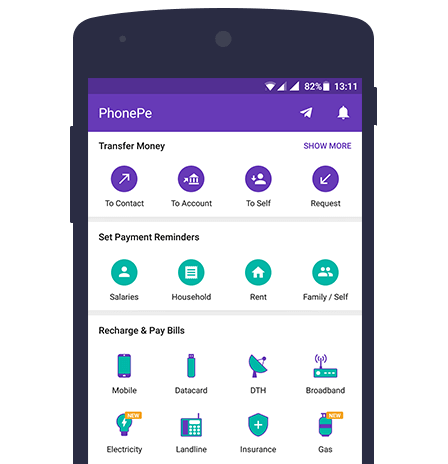 Phone Pe is a UPI-based app, which is owned by Flipkart and Yes bank is partnered with phone pe for UPI system. On Phone pe app, You can check your account balance, transfer money instantly, save beneficiaries and manage multiple bank accounts in one App. Get all the benefits of an E-wallet and the huge advantage of transacting directly from your bank account with PhonePe. So, you don’t need to remember to recharge your wallet, and there are absolutely no hidden charges. PhonePe is the fastest and cheapest way to transfer funds. Unlike other modes of payment, it allows you to make transactions worth Rs.30 lakh a month from your bank account. Additionally, you can also use the E-wallet to transact up to Rs.20K a month. Shopping online and running short of funds? Pay using the PhonePe UPI along with other payment modes like Credit Card, Debit Card & NetBanking. PhonePe allows you to use multiple instruments to pay for the same bill. So use the payment methods of your choice or use money between instruments. PhonePe dramatically improves your refunds and cashback experience by allowing you to transfer money to your bank account in an instant. Now you can shop without worrying about funds being locked up in a wallet. Say goodbye to a beginning of the month woes! Pay staff salaries and rents, manage yours recharges and utility bills without standing in long ATM queues to withdraw cash. You can pay for everything with PhonePe. If you face any problem on Phone Pe app or want to contact Phone Pe customer Care Team, then Call On 0124-6789-345.